Phoenix Coyotes General Manager Michael Barnett announced today that the Coyotes have signed defenseman Sean Sullivan to a multi-year contract. As per club policy, terms of the contract were not disclosed. This season, the 6-foot, 195 pound defenseman played 38 games with Boston University (Hockey East), ranking 7th on the Terriers in scoring with 3-12-15. Sullivan was a 2007 Hockey East First Team All-Star and the recipient of the league's Old Time Hockey Best Defensive Defenseman award. 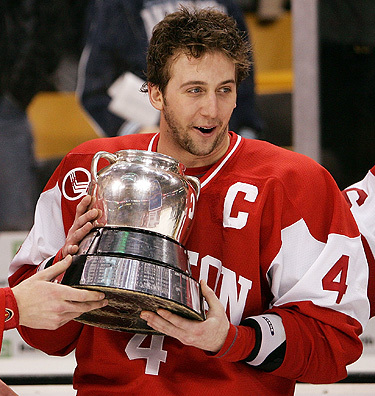 He was also captain of the Terriers and led the team to a 20-10-9 record. The 22-year-old native of Braintree, Massachusetts ranked 2nd among BU defensemen in points and assists and 3rd on the team in plus/minus with a plus-13 rating. He also ranked 4th on the Terriers in power play points with 1-7-8 and 7th in shots (58). In four seasons with Boston University, Sullivan missed only 3 games due to injury, playing in 155 of 158 games and recording 9-34-43. Sullivan's 155 games played rank him 7th all-time in BU history. He was drafted by the Coyotes in the 9th round (272nd overall) in the 2003 NHL Entry Draft.